Manhattan neighborhood index for folks relocating to Manhattan. The Upper East Side has been considered Manhattan's most prestigious residential neighborhood covering the East of Central Park to the East River, and from 59th Street at its southern boundary to 96th Street at its northern boundary. While the most coveted, prewar homes on Fifth and Park Avenues are beyond the financial reach of all but the wealthiest New Yorkers, there are also surprisingly good values that abound nearby. There are exceptional values in all ranges of housing from post-war hi-rises to brownstones, and from rental to coop/ condominium ownership. It is the perfect quiet, residential area to raise a family with proximity to Manhattan's best private and public schools. Central Park, itself, is the best "backyard" anyone could dream of with it's zoo, playing fields, tennis courts, parklands, rowing and world class natural charm. The city's largest concentration of its toniest shops and cafes can be found on both sides of Madison Avenue. Yet elsewhere lurking on the eastside, you will find other famous, outrageously expensive stores such as Sotheby's and Christie's auction houses, Henri Bendel, Tiffany's, and Louis Vuitton. Upward of 70th Street, Fifth Avenue, also known as Museum Mile, is home to some of the foremost art institutions in the world such as The Metropolitan Museum of Art, the Guggenheim, the Whitney Museum of American Art and the Frick Collection. Between 86th Street and 96th Street between 5th Avenue and Lexington is the Upper East Side neighborhood Carnegie Hill, named after the Carnegie mansion on 91st and Fifth. Even the official residence for the Mayor of the City of New York, Gracie Mansion overlooks the East River from East 88th Street. The Upper West Side is populated with some of Manhattan's most famous and desirable residential buildings, The Dakota, El Dorado, The San Remo Apartments, The Ansonia, The Oliver Cromwell, The Langham, The Kenilworth, Hotel Des Artistes, The Beresford and The Ardsley. The Upper West Side boundaries are 59th Street to the South, 110th Street to the North, Central Park West to the East and the Hudson River to the West. Central Park West, Riverside Drive and West End Avenue have always been considered family oriented neighborhoods, over recent years this area has become more attractive to young professionals. Purchase prices in the many of the Upper West Side's coveted prewar buildings has approached, and in occasion exceeds, values commonly found on the East Side's Park and Fifth Avenues. The Lincoln Center complex is home to the Metropolitan Opera and Julliard School of Music, Avery Fisher Hall, Alice Tully Hall, the New York City Ballet and the Vivian Beaumont Theater. The American Museum of Natural History is located on a stretch of Central Park West between 77th and 81st Streets, The museum's new Hayden Planetarium is a galactic spectacular and is well worth the invested time. It is a true pleasure to walk along the Upper West Side and take advantage of the well established blocks, trendy boutiques, and restaurants. My favorites are: Fairway, Zabars, Citarella and the famous H&H Bagels all located on upper Broadway. Designed it the late 1850s Central Park spans 843 acres between Fifth Avenue and Central Park West, and 59th Street to 110th Street. Many people take advantage of the park by enjoying year-round jogging, running, cycling and rollerblading unconcerned about motorists and or traffic lights. The winter offers, outdoor ice-skating at the Wollman Memorial Rink. In the spring and summer months the park comes to life. You will find opportunities for an adventure everywhere, the old-time carousel, the Zoo, a chair & book and suntan in the wide-open space of the Great Lawn, or perhaps an afternoon of rowing at the Boathouse. Once the summer months arrive, the Great Lawn is also the venue for many free concerts. Autumn offers everything from horse fans enjoying the crisp autumn air and turning leaves for a leisurely trail ride through the Park's winding bridle paths to cheering on the thousands of participants in the annual New York City Marathon. Whatever the season, your age and your particular interest, Central Park surely has something for everyone. Midtown, encompassing the vast area between 34th Street to the South, 59th Street to the North, First Avenue to the East and Seventh Avenue to the West, is Manhattan's main business, commercial and retail district. This area is well known for many world famous attractions such as The Empire State Building and The Chrysler Building. Murray Hill is located below Grand Central Terminal. Grand Central Station: Grand Central has benefited from an extensive face-lift over the past several years. The ceiling's renovations are a sight to see, depicting the twelve signs of the zodiac. Not to be missed are the intricate marble details and eye catching chandeliers. Built at the turn of the 20th Century, the terminal houses an extensive array of retail establishments and eateries. The area to the far west in the 30's is slated to be developed adjacent to the Jacob Javits Center and the development of the Hudson Rail Yards and the High Line Park which will run from Hells Kitchen through West Chelsea to the Meat packing district in the West Village. Chelsea, which runs from the Hudson River to the Avenue of the Americas (Sixth Avenue to locals), is largely residential area with a varied mix of high-and mid-rise buildings, brownstones and industrial lofts. The neighborhood's increasing popularity over the past 20 years, particularly among young families, has lead to the development of an impressive array of restaurants and shops. Chelsea today is a vibrant neighborhood with off Broadway theaters, new cutting edge art galleries, restaurants and bars. The famous landmark Hotel Chelsea is where many famous artists, writers and musicians have stayed. West Chelsea from 10th Avenue to 11th Avenue, from 16th Street north to 30th Street, is booming with new condo developments that are transforming the once gritty Manhattan neighborhood into a fashionable destination. Most of the new developments will happen around the High Line. New condos with park views. The High Line runs through three of Manhattans most dynamic neighborhoods, Hells Kitchen, West Chelsea and the Meat Packing District. Plans are underway to transform a 6.7acre span of former elevated train track running 22 blocks into an open park. Heading eastward into the Flatiron district, which overlaps Chelsea on Sixth Avenue, over to the Eastern boundary of Park Avenue South, you will find yourself surrounded by many top name boutiques. One such store is: ABC Carpet and Home. A one-of-a-kind department store devoted to the beautiful home. Antiques, furniture, rugs, linens and other home decorating items. Another Flatiron specialty is "Union Square". Filled with numerous eateries that line either side of the Park, New York's premier Greenmarket, set-up on the northernmost point each Wednesday, Friday, and Saturday. You will be able to find seasonal and organic produce, flowers, freshly baked breads and pies. Gramercy Park, historically known to once be one of the City's most elegant residential neighborhoods. Bounded by Park Avenue South and Second Avenue, its lovely tree-lined streets emanate much of the charm and warmth of the past. One of the privileges of this district is its own private park, accessible only to area residents who are provided with a key. Continues to be a popular place to live. Divided into two separate neighborhoods, the Village is bounded to the South by Houston Street, to the North by 14th Street, to the West by the Hudson River and to the East by Lafayette Street. Broadway is the dividing line between the two, distinctively different, districts of the Village. 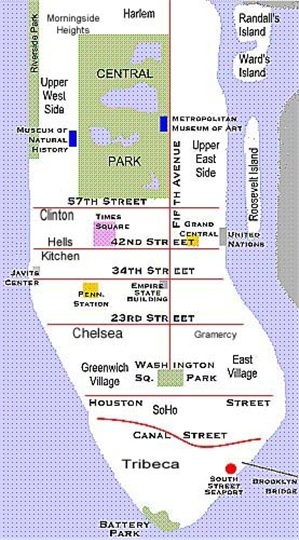 Commonly referred by most people that live in the Village: West of Broadway to be defined as "Greenwich Village", while the area to the East of the Broadway to be defined as the "East Village". So when discussing the "Village", it is commonly understood that one is speaking of the area West of Broadway. Those referring to the area East of Broadway will always qualify their discussion by using the distinction "East Village". Greenwich Village has a charming, small-town feel with its irregular tree-lined streets, brownstone apartment buildings, and elegant townhomes. The Village's informal atmosphere has long attracted those of unconventional thinking-writers, actors, academicians, scholars and artist who preferred to stay well out of the mainstream. New York University, The New School for Social Research and Parson's School of Design all call the Village home. Greenwich Village is also home to many fine restaurants that will satisfy a range of tastes as well as budgets. For a completely different night out, try a late Friday or Saturday dinner at Florent, A French bistro/diner in the Meatpacking district. The food is not the thing here, but the people watching is superb! Experimental theaters, avant-garde clubs such as the infamous CBGB, funky boutiques selling cutting edge street fashion and numerous unlicensed vendors selling every type of used household item imaginable. Tribeca: Formally an area of heavy manufacturing and industry, Tribeca is now home to New York's trendiest artist, Models and actors. Tribeca refers to the area designated as the Triangle Below Canal Street, bordered to the East by Broadway, to the West by the Hudson River, to the South by Chambers Street and to the North by Canal Street. Alternative galleries and pricey boutiques line West Broadway, the area's major thoroughfare. Some of the City's most difficult dinner reservations are in Tribeca's numerous restaurants including Montrachet, Chanterelle, Bouley Bakery, Nobu and the Tribeca Grill. Soho: Soho (which stands for South of Houston) is a premiere destination for the world's trendiest jet setters, New York's SoHo district has something to offer just about everyone. Bordered to the North by Houston Street, to the South by Canal Street, to the West by Sixth Avenue and to the East by Broadway, Characterized by the imposing cast-iron architecture of the late 19th Century built for manufacturing and warehousing, SoHo was mostly abandoned and then re-discovered by starving artistd who were attracted by it's cavernous spaces with good light and comparatively low rent. In the early 1980s, as the area's popularity spread, soaring rents drove the original artist colony to seek less costly neighborhoods. Their exhibition galleries remained however, and today the works of some of the world's most celebrated contemporary artist are on display commanding shocking prices. Imagine the convenience of being able to work right in your own neighborhood, well Battery Park City was designed for residents to do just that. The World Financial Center and the New York Mercantile Exchange are surrounded by some of the most distinguished highrise residential buildings in lower Manhattan - best of all - any building constructed later than the year 2000 has been designed to use sustainable technology to reduce energy use and increase the health of its residents. The Solaire, is the nation's first "green" residential highrise and there are six more to come all within the 92 acres of Battery Park City. So no matter whether you choose to rent or purchase, you'll find healthier living in Battery Park City. You'll also find great schools - The unique and innovate P.S./I.S. 89 - the first public/middle school ever built in the base of a residential tower and the world renowned Stuyvesant High School are both located within Battery Park City's 92 acre footprint. Suburban type living in lower Manhattan. To receive new lisings by email click here. MITCH - This is an amazing job! I have no idea how you linked up each section to take you to individual posts about the area, but you have set the bar incredibly high for others to follow. Having lived in Manhattan, and working there (as you know), I have a real appreciation for the variety of life that is offered from area to area. Thank you for sharing this. Mitch, what a comprehensive guide to Manhattan. An excellent resource, for sure, for those moving to the area. While I don't plan to relocate to Manhattan, I've bookmarked the post as a guide for my next visit to the Big Apple. Great information for those that want to relocate to Manhattan, very detailed. I hope you will recieve some leads with this. This really makes me want to relocate! It's time for another visit! My neighbor and I are both having these NY fantasies. I'm bookmarking this one! Adam, You inspired me with the local expert challenge. I didn't think we could use previous posts until I read your post yesterday so I wrote a new one that included all my previous neighborhood posts. I used image map maker for the links, It was harder than it looks lol. Mitchell ~ Wow! You have provided a wealth of information here. I always wondered what it would be like (once the kids are out of the house) to move to the city, and have literally everything right outside your door. Hi Kathy, Thanks for stopping by. Empty nesters love living in the city. This is one of the best local posts I have seen on ActiveRain!!! I'm like Kathy.......I always wondered what it would be like to live in NYC. I have a better idea now than I ever would have before. Thank you!! Mitchell - What a great local post. It has been featured in I Love NY. Bob, Thank you I really appreciate the compliment. I tried to encompass my body of activerain work in this post. (lol) I'm glad you liked it. This should be included in tourists guides as well. Wonderful presentation. I'm so glad I found you and your writing. These are fantastic!! Fabulous, great guide for anybody relocating to NY. Great post.I love Union Square and Gramercy area. Is there a website where i can download maps of the burros bus lines and subways? I know boston sent me information packets for free was hopeing that NY would have one too..
Below is link to the Metropolitan Transit Authority website with bus and subway maps. NYC.gov is the city's website. It is quite comprehensive. NYC.gov is the portal to many city agency websites such as departments of planning, zoning and housing featuring maps and neighborhood information and data. Links below.